It is important to me to share my dad's story. In so many ways he is the man I want to be. When my dad was only 6 years old his mom died, and his dad during the difficult financial times of 1929 placed my dad along with his brothers and sisters in a children's home. He lived there until age 17 when he was turned out on his own with only $7 in his pocket. So much for social services. 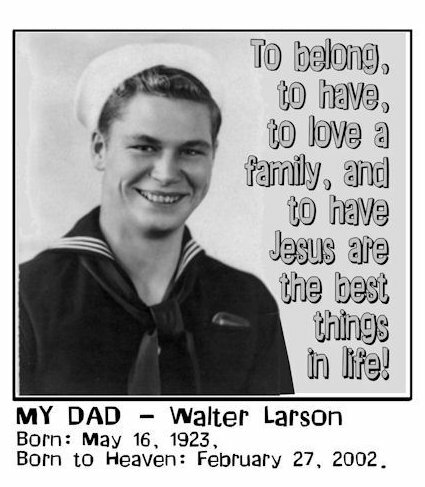 Dad then enlisted in the Navy during WWII. These were incredible years being a part of this significant time in history including D-Day at Normandy and the details of these years were etched in his memory. Dad would share with me often his experiences as he sailed across the ocean during these Navy years..
After the War dad was heartbroken over the difficult times his brothers and sisters were experiencing. He was lonely, drank too much, and was unhappy to the point of attempting suicide with a gunshot to his chest. But dad survived, and was given another chance at life here on Earth and for eternity. While still in the hospital recovering dad was led to know Jesus as his savior. 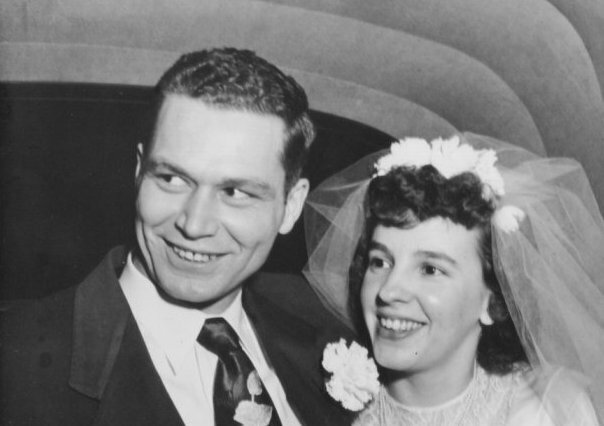 Just a few years later he was introduced to Nellie Ross, they fell in love, married and my dad for the first time in his life had a true family and happiness. 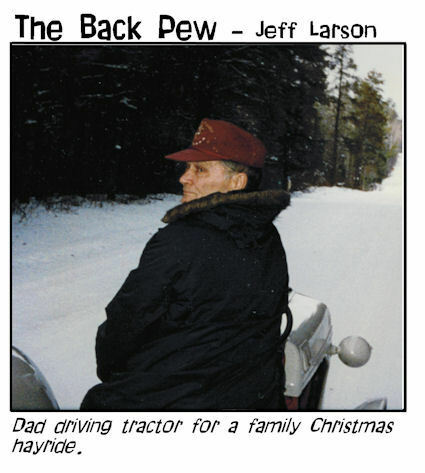 The Family Man: After marrying my mom, he lived the next nearly 50 years in northern Wisconsin. 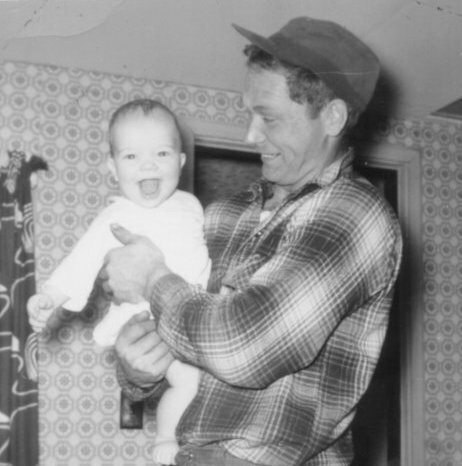 He worked as a logger for most of these years, and though we never were wealthy, but we always had enough. He lived his life as a quiet man with a good reputation. He cared, loved, and provided for mom, my sister Machelle, and I. He was a man who truly enjoyed the simple pleasures of life which included strong coffee. Once grandchildren came along, he played the role of grandpa in his own unique manner with the ability to make up stories, and create adventures for his grand kids that they still remember. ALS: In August of 2000 dad went to the VA hospital to follow up significant changes in his health. This is when he was diagnosed with ALS (Lou Gehrig's Disease). Over the next year and one half this terrible disease tore down his once strong body. He lost his speech, the ability to eat except through a feeding tube, but his mind stayed clear and sharp. The amazing fact that I have come to realize after his death is that God used this time to prepare him for Heaven, and deepen his faith. Christmas 2001 was our last Christmas together. We knew time was short, but we wanted to make this Christmas special. So we decided as a family to each share our favorite Christmas memories. 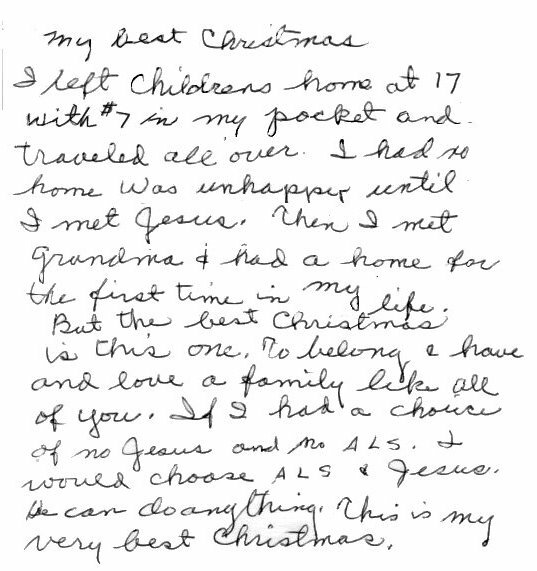 We each shared special Christmas memories, of toys, or family get togethers.. Well the following letter is what dad shared..
Making that final trip to Heaven... Monday, February 25th, 2002 I received a call from the hospice nurse that the end was near. I was fortunate to make it home and be able to visit, and care for him during his last days. A very special memory at this time was mom at his bed side the evening before he died. 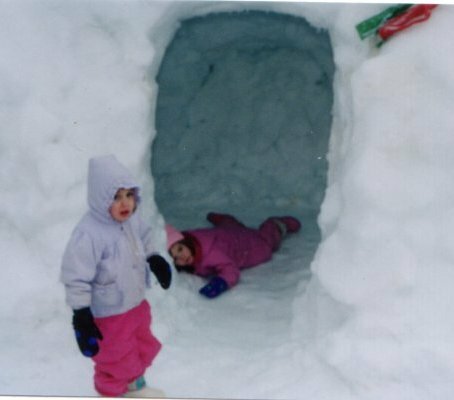 Dad was bed-ridden struggling, gasping for air, and disoriented. Mom leaned over to him and said.. "You know I love you, and kissed him on the cheek.".. Dad turned to mom focused on her eyes, and squeezed both hands, and touched her cheek. That was the last communication dad made with any of us as he passed away early the next morning. Saturday March 2nd, at 11 a.m. CST at Cable Alliance Church in Cable Wisconsin was dad's funeral. It was a time of rememberance, and honoring, and celebrating his life. We mourned, we cried, but we also laughed, celebrated his life, and the start of his eternal life. His 79 years on this earth may seem to be a long time, and were filled with many highs and lows, but as a believer there is HEAVEN. Eternity with our creator, and you don't have to be a math genius to realize eternity is a 'bit' longer than 79 years. I share this to encourage those who have lost a loved one as an infant, young child, teenager, young adult, or maybe cut down in the prime of life at 100 years. life is not fair, but this time on earth whether it is short or long, happy or sad.. is just a drop in the bucket of eternity. I believe if dad was in the parable of the talents, there would be the guy with 5 talents, another with 3 talents, one with 1 talent, and dad was instructed find a talent then see how that works out. What I am saying is .. Dad grew up without a mom or dad to model before him how to be a husband, father, or friend.. BUT he succeeded at all these critical roles in life. Thank you for taking time to read this tribute to Walter Larson.